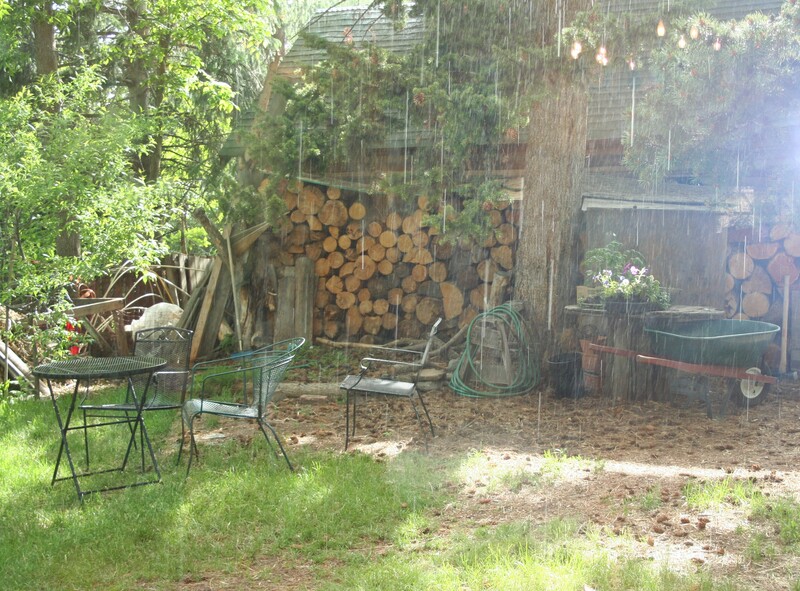 It’s amazing what you can make from the garden, even before it gets going. Yes, I know, pesto is made from basil. 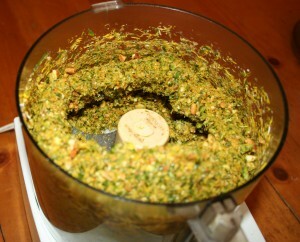 (Also pine nuts, butter, parmesan, garlic, and sometimes parsley.) But years ago an Italian friend confided to me that only Americans were so hidebound as to think that it had to be made from those ingredients and nothing else. In Italy, she told me, pesto was made from all sorts of things. At the time, I looked at her askance. She and pesto might both be Italian, and I might pride myself on being openminded, but there were limits. Over time, however, I’ve gradually abandoned one of those key ingredients after the other, until only the garlic remains a constant. First, in the absence of pine nuts (or perhaps in a fit of fury over their preposterous price), I tried walnuts instead. Then butter gave way to olive oil. And a couple of years ago, I tried using other greens: arugula, sometimes leavened with dandelion greens, kale, even lettuce. 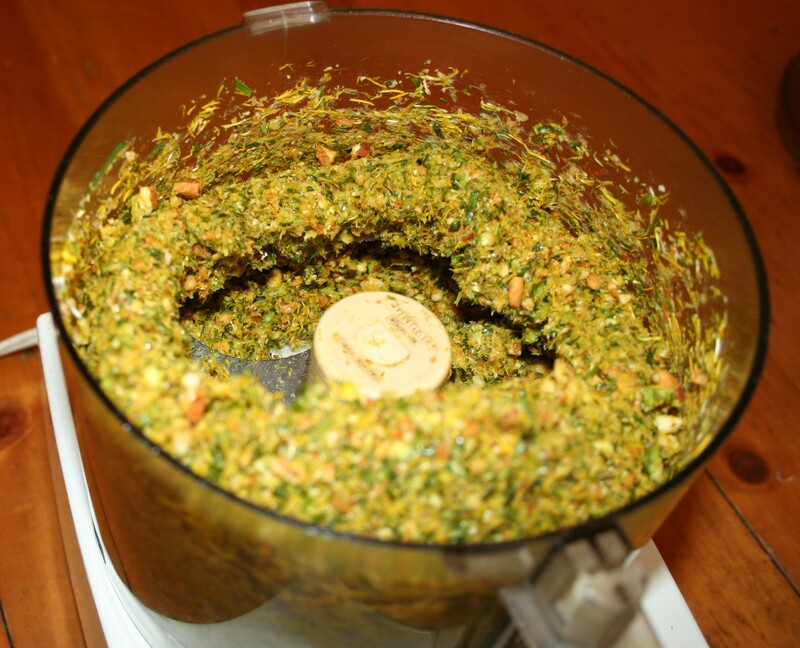 Pesto, after all, comes from a word meaning to pound, as in “mortar and pestle;” it doesn’t say anything about what gets pounded. So this spring, when I found myself with—well, lots and lots (and lots) of young mustard greens, way too many chives, and of course, the usual springtime onslaught of dandelions, I bethought me to try a new combination. The result, which I inflicted on four friends and my SO (i.e. Significant Other, a.k.a. husband, spouse, partner) was well received all round. 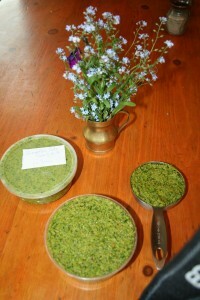 I’ve make three or four batches since, each slightly different, all of them delicious. Tonight I’ll be taking some to a potluck where not everyone is acquainted with my peculiar culinary inclinations. Wish me luck. Here’s the process, followed by the recipe. That’s some slightly fuzzy mustard (in which the garden abounds)—mustard is a bit fuzzy, so I guess it’s apt that the picture’s slightly out of focus. (I could pretend I did it on purpose. 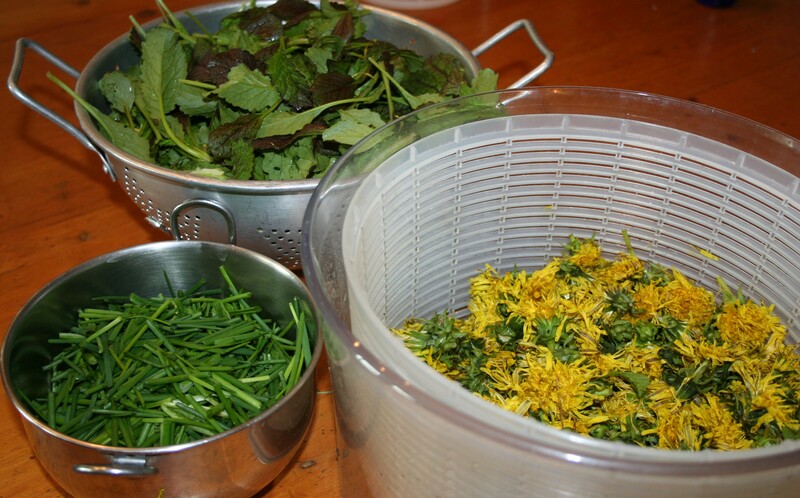 Hmm…) In the lower left you find your chopped chives, another abundant ingredient, and on the right, yes, dandelion flowers. They look a bit bedraggled, after immersion in water and the trauma of being spun, but so would you after such treatment. The non-garden ingredients were olive oil, toasted almonds, garlic and salt. 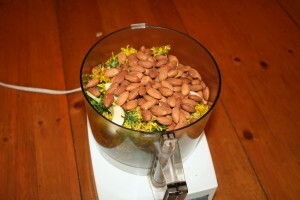 We commenced by depositing the garlic, the dandelion flowers, and about half the nuts in the food processor. As you can see, the bowl’s already pretty full. We actually had to remove some of that first round in order to get all the chives and mustard incorporated, but once that was done, we were able to mix it all. Here’s the yield—about 3½ cups worth, most of what went into the freezer. In the meantime, the weather was doing its thing outside in the back yard–sun and rain, and somewhere, a rainbow. 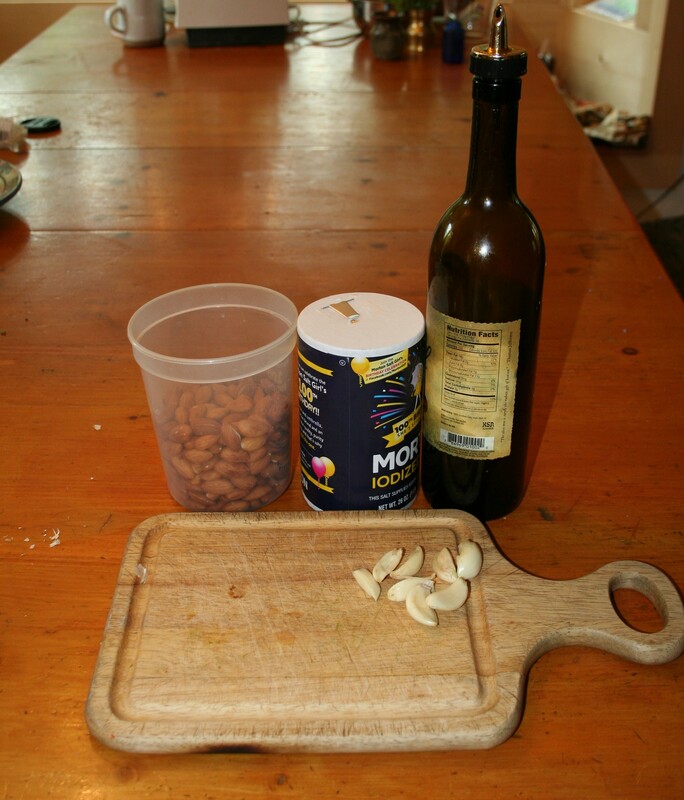 Spread it on freshly boiled pasta and top with parmesan cheese. It will keep in the freezer for months. Just hack off enough for your meal and return the rest of the block to the freezer. 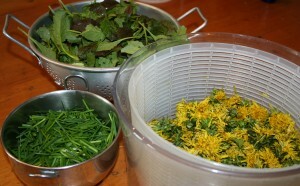 To ensure that the dandelion heads and garlic are thoroughly ground up, I started with them. Toss in some of the olive oil at the same time, and you’ll probably be able to add all the other ingredients, bit by bit, to the mix. We like a bit of nutty texture to our pesto, so I ground half the nuts with the flowers and garlic, then added half as the last ingredient, grinding until the mixture had the desired consistency. It will taste too salty in this form, but not on something bland like pasta. If you’re low on things to be mad about, I’ve got an article for you. But if your blood pressure is already high, maybe you should pass.